Habit: Annual, glandular, sticky, odorous. Stem: erect, much-branched. 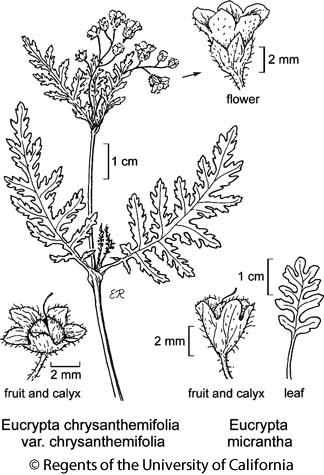 Leaf: 1--3-pinnate-lobed; lower cauline opposite, petioled, upper alternate, upward smaller, sessile, clasping; petioles generally narrow-winged, ciliate. Inflorescence: terminal or axillary; pedicels thread-like, elongate in fruit. Flower: calyx < 1/2-fused, bell-shaped, glandular, lobes oblong to ovate to spoon-shaped, ciliate; corolla bell-shaped, generally >= calyx, with or without V-shaped transverse fold between each pair of filaments below throat; stamens included, equal, equally attached; ovary chamber 1 (or appearing +- 5 from complex, enlarged placenta), ovules on both sides of placenta, style 1, stigmas 2. Fruit: capsule, ovoid to spheric, bristly. Seed: 5--15. Stem: weak, < 3 dm, generally stalked-glandular. Leaf: lower 1--5 cm, < 2 cm wide, petiole short, widened to clasping base, blade oblong or ovate, deep-1-pinnate-lobed, lobes 7--9, oblong or oblanceolate, straight or sickle-shaped, entire or few-toothed, upper leaves greatly reduced, lobed, toothed or entire. Inflorescence: flowers 4--12 per branch; pedicels generally erect in fruit. Flower: calyx 2--5 mm, lobes erect, enclosing fruit, generally black-glandular; corolla 2--4 mm, white or blue-purple, tube yellow, V-shaped fold present; style 1--2 mm. Fruit: 2--3 mm wide. Seed: 7--15, oblong, in age incurved, worm-like, black or dark-brown, wrinkled. Chromosomes: n=6,12. Synonyms: Phacelia micrantha Torr; Macrocalyx micranthus (Torr.) Coville; Nyctelea micrantha (Torr.) Wooton & Standley; Ellisia micrantha (Torr.) Brand; Phacelia pinetorum M.E. Jones; Eucrypta pinetorum (M.E. Jones) Rydb. ; Nyctelea pinetorum (M.E. Jones) Tidestr. Citation for this treatment: Robert Patterson & Richard R. Halse 2012, Eucrypta micrantha, in Jepson Flora Project (eds.) Jepson eFlora, http://ucjeps.berkeley.edu/eflora/eflora_display.php?tid=25305, accessed on April 24, 2019.